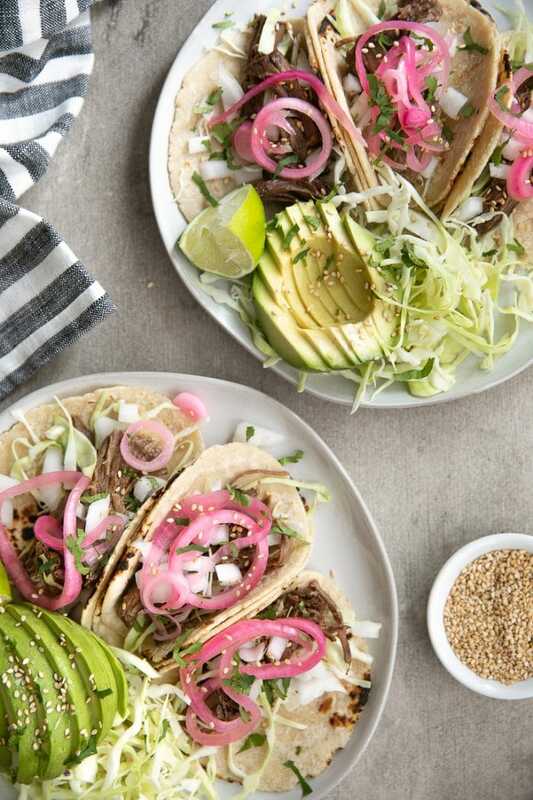 Lime Teriyaki Shredded Beef Tacos are an easy and delicious anytime family dinner made with moist, juicy, and flavorful Slow Cooked Shredded Beef. A family favorite, taco recipes including these Roasted Butternut Squash Tacos with Chipotle Lime Crema, Instant Pot Shredded Salsa Chicken Tacos, and Salsa Verde Cauliflower and Lentil Tacos with Mango Pomegranate Salsa, are easy, healthy, and perfect year round. Juicy and flavorful slow-cooked meat piled high and wrapped in a tortilla. That is the taco. 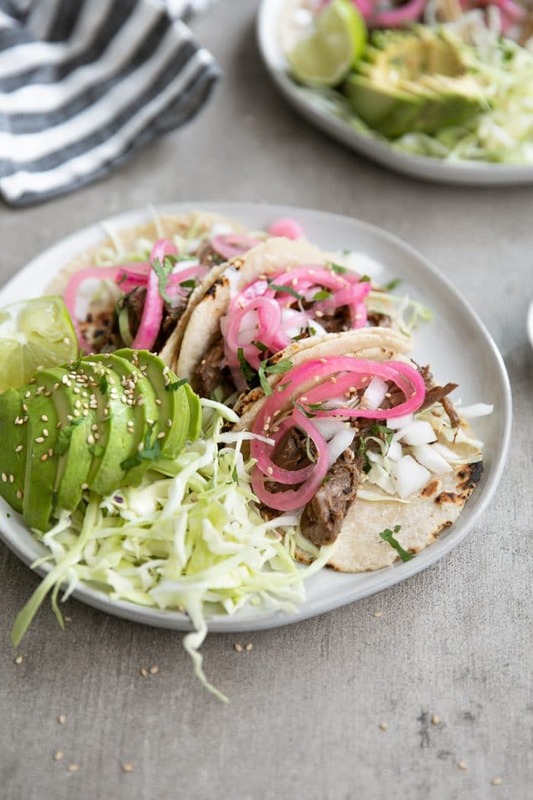 At least, that’s what these Lime Teriyaki Shredded Beef Tacos with crunchy cabbage, white onion, and pickled red onions are all about. 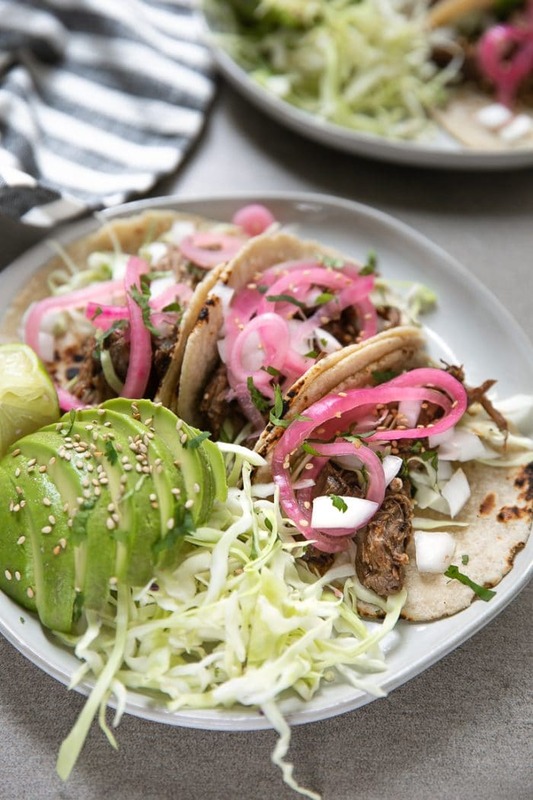 Made in the slow cooker, the shredded beef is the star of this tacos…with the pickled red onions coming in second, but more on that later. 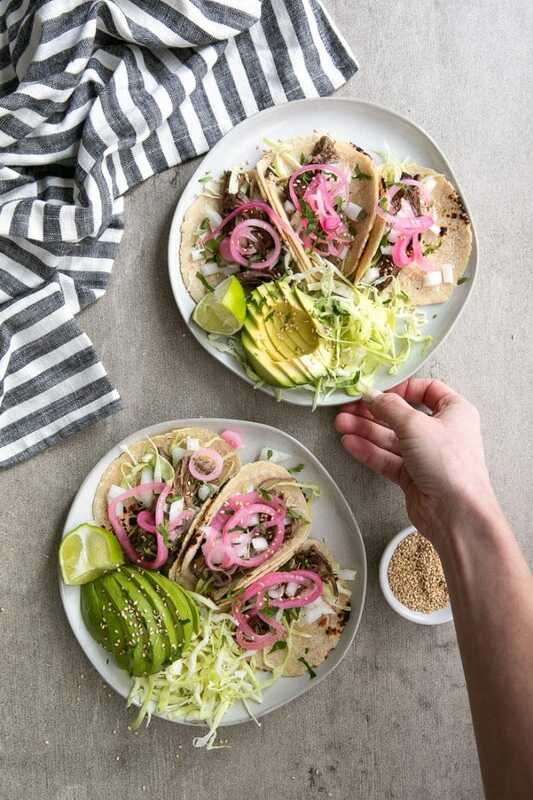 The perfect balance of sweet and salty, and so juicy, this shredded beef tastes perfect in not just in these shredded beef tacos, but also on salads, quesadillas, and sandwiches. The ingredient list for this recipe can seem lengthy. That said, most of the ingredients are pretty basic and easy to find, so try not to fret. I’m going to guess that you already have a handful of these ingredients in your pantry. Dump and cook. Aka, this shredded beef is EASY! Make extra and feed the family for a week. My whole entire family ate it- even the kid (minus the cabbage…or pickled red onions). Versatility! yes, I love tacos. And, yes, I could probably eat tacos every night of the week, however, change can be good. Use the leftover shredded beef on pizza, meal prep, or piled in a bowl with roasted veggies with rice. It is SO GOOD. But, really. It is THAT good. It’s cooked in the slow cooker, and you can never have enough slow cooker dinners. They can easily feed a crowd. Now, it should go without saying that you’ll need a Slow Cooker to make this shredded beef. This is the Slow Cooker this is use and love. It’s on the larger side, but (if you ask me), extra is always better. For this recipe, I chose to keep the toppings simple since the shredded beef is so flavorful. I added shredded cabbage, diced white onion, pickled red onion, cilantro, and sesame seeds. Fruit. guys, just try it. Orange, pineapple, strawberries, and pomegranate are all delicious options. In a small bowl combine the paprika, chipotle powder, thyme, salt, pepper, onion powder and garlic powder. Set aside. 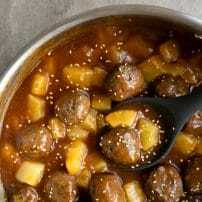 In a separate bowl whisk together the sugar, lime juice and zest, soy sauce, and rice vinegar. Add the chuck roast to your slow cooker and massage both sides with the dry rub, making sure to get in between any folds of the meat. Add the lime juice mixture, beef broth, and bay leaves to the slow cooker. Set slow cooker to high and cook for at least 5-6 hours. After the beef is fully cooked, remove meat from the slow cooker and shred with two forks. Transfer back to the slow cooker and add 1/2 cup teriyaki sauce. Mix well to combine. Switch slow cooker to low and continue to cook until ready to serve. Prepare tacos by placing a large spoonful of shredded beef onto each tortilla. 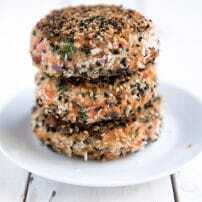 Garnish with shredded green cabbage, white onion, pickled red onion, sesame seeds, and sliced avocado. Enjoy! Want to try these SHREDDED BEEF TACOS? to your Slow Cooker or Dinner Ideas Boards on Pinterest and save it for later!